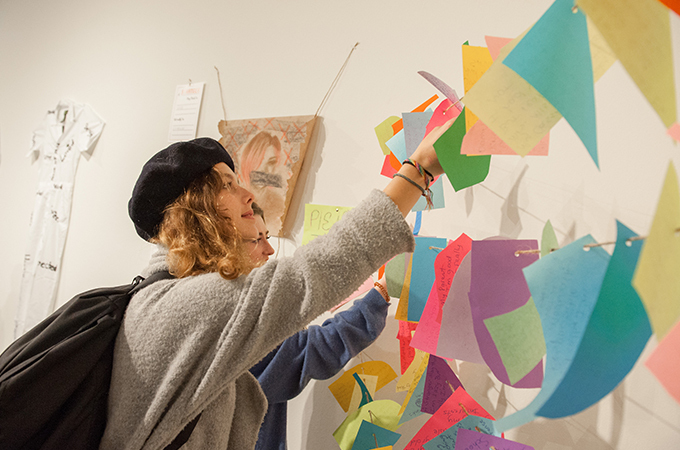 The University Art Gallery recently hosted a new kind of show. Instead of featuring artwork by a University of Redlands faculty member, visiting artist, or class of graduating art majors, the display put the spotlight on creations made by participants of a unique series of interdisciplinary workshops held this fall. To Galloway’s delight, individuals from across the campus and city—including graduate and undergraduate students, faculty, parents, and community members representing a variety of backgrounds—were drawn to each of the three two-day events. In the first workshop, titled How to Do Things with Color, Galloway led participants through an exploration of color theory and practice, including the perception of color, the social and cultural coding of color, and the relationship of color to emotion and meaning. Students worked on projects that demonstrated how the quality of color depends on its surroundings, and how color mixes in completely different ways depending on whether it’s material (such as paint) or light (such as a rainbow). One project with construction paper paired complementary colors, so the boundaries between them danced and vibrated. 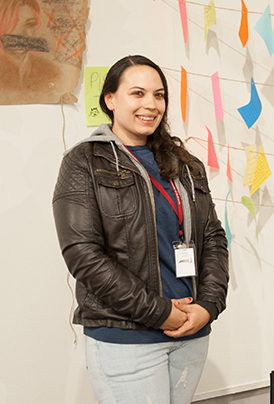 Red Wing, formerly of Native student programs and now a faculty member in the Art Department, led the second workshop, Big and Bold: Art Practice and Social Justice. The workshop introduced participants to the work of several artists in the field, including Adam Delmarcelle, Nikki Juen, and Antoinette Caroll. For the hands-on portion, the class split into three groups. The first group worked on pieces to be shown on a projector. The second worked on design to go on top of blank, white coveralls. 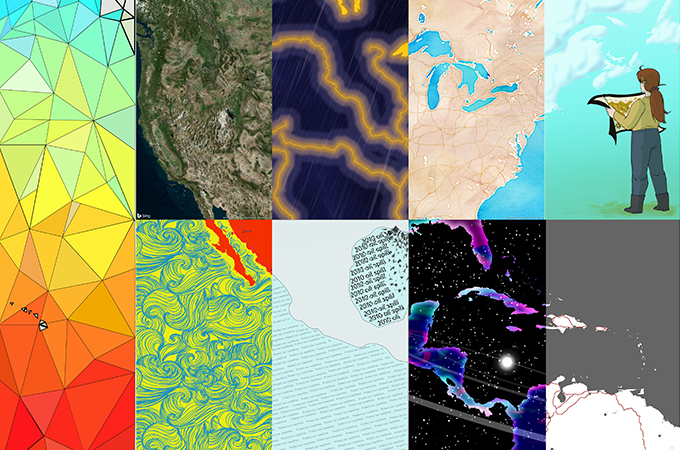 Kumler taught the final workshop, Art of Effective Map Design. 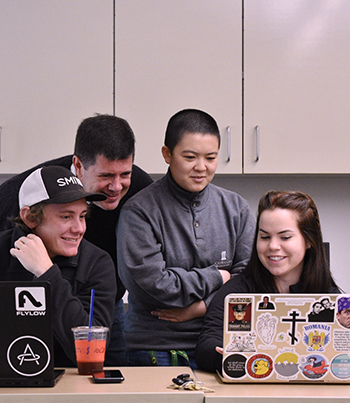 “Munro and I discovered that we give very similar lectures on color theory and the use of color and illustrations, even though we were from opposite sides of campus—literally and figuratively,” said Kumler, whose workshop brought together a mix of master’s GIS students and undergraduates from other fields, including art. The class was divided into three teams and tasked with making a “quilt map”—literally stitching together their individual perspectives represented on single tiles into a whole map of Redlands, California, or the Americas. 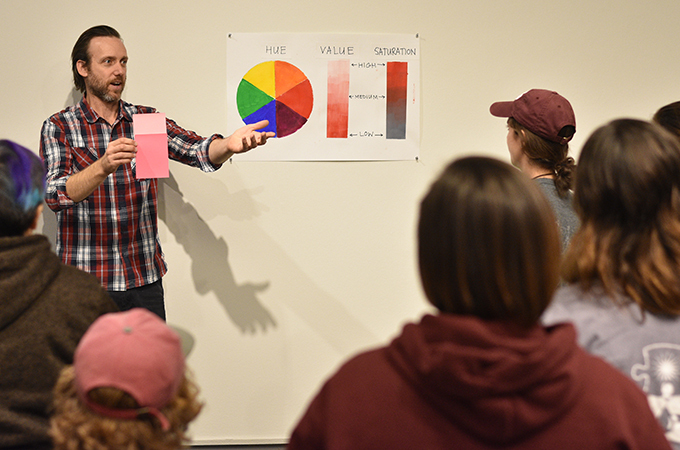 With the successful fall workshop series now behind them, Galloway, Red Wing, and Kumler hope to continue to build interdisciplinary collaborations across campus and explore new ways to teach and create. 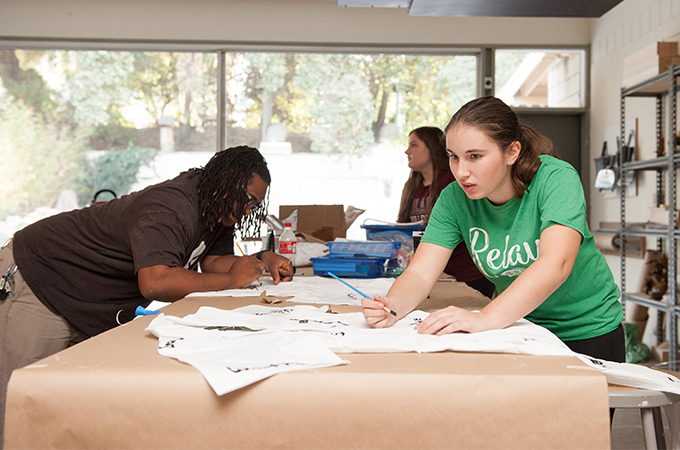 Read more about the studio art, spatial studies, and Native Student Programs at the U of R.